Wow guess what I have managed to do something for me!!! I have tried some canvas art. With this one I just covered the canvas with gesso then red acrylic paint. Around the edges I added some bronze paint then some darker areas. 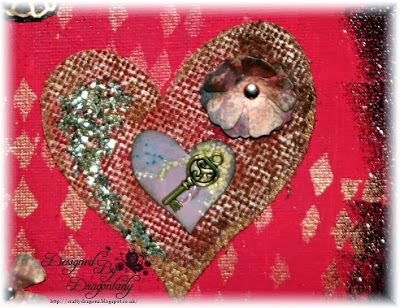 The heart has been die cut out of a piece of fabric using an Xcut die called Homespun Heart. I then put some of the paint on this too - lovely inky fingers. 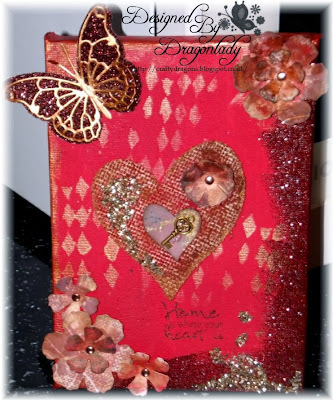 I have added some Frantage glitters and Mahogany embossing powder. The flowers have been cut using the Tim Holtz Tattered Florals die then put brads in the middle. 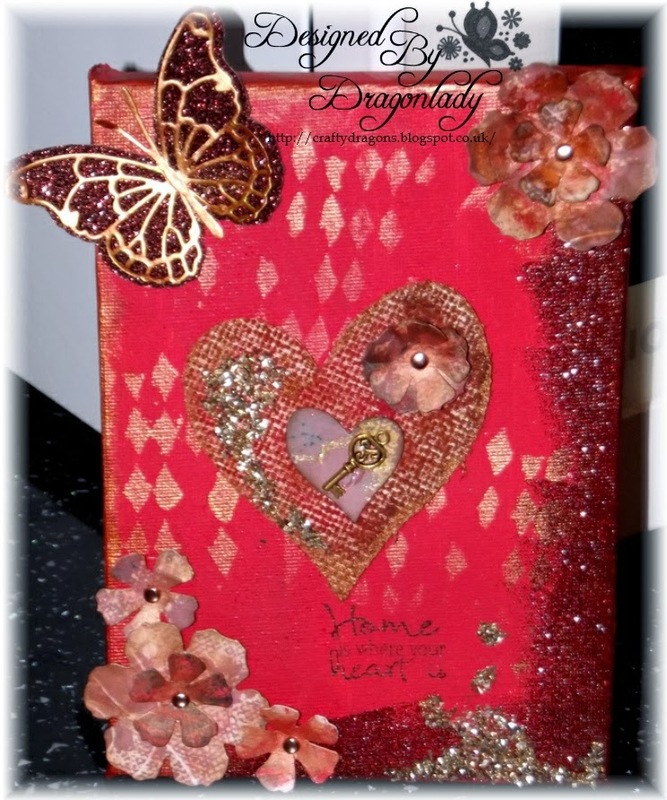 The butterfly is a Memory Box die called Vivienne and used this to cut out the background in a dark brown glitter card. The stamp is one from my stash that I won several years ago now. I have also used a stencil from Dylusions called Diamond of a Border and the bronze paint. I was inspired by the artist over on Paperartsy, Jo Myhill. She has done three projects so I have tried to take some ideas from them and came up with this. 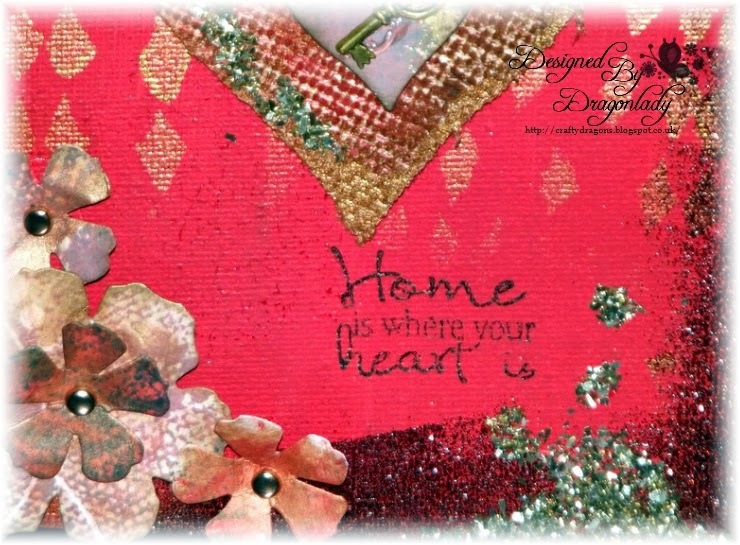 Divas By Design - Use red. I really hope I have time to do more of this as I really enjoyed it. Wow that looks really good Ali! well done on making something just for you, it's all too easy to get caught up making projects for other people all the time. I love the yummy red background here and the glitters. A wonderful mix of patterns and textures! Thanks so much for sharing this with us at the Simon Says Stamp Wednesday Challenge! Love the artwork, the colors are wonderful too. Thanks so much for joining in the fun at the Sparkle N Sprinkle November Challenge. Hope to see you again next month! Oh Ali get you!! Miss Clever Knickers!! Great canvas hun - I have two sitting here waiting to be "artied" - Lol.